How To Buy The Best Adjustable Bed - Which? We’ll help you buy the best adjustable bed for your needs. Find out what to look for, prices and questions to ask yourself before you buy. Adjustable beds don’t come cheap, so it’s important to think carefully before you splash out on one. Get advice If you have a complex medical condition, or changing health needs, you should seek advice from a healthcare professional, such as an occupational therapist or community nurse, about which bed would best suit your needs. Adjustable bed features Make a list of the features you need and want. Don’t forget that the more features the bed has, the more expensive it will be - there’s no point paying for features you won’t use. Try before you buy As with any new bed, you should test an electric bed for comfort before you buy. Have a lie down; a good retailer will understand the importance of this. Some specialist bed/mobility companies offer free home demonstrations or a free no-obligation trial of your new bed. Take a friend/family member If you are visiting stores, or inviting an adjustable beds salesperson into your home to discuss options, it’s a good idea to have a friend or relative with you for help, advice and support. Approval schemes Look for the National Bed Federation mark of approval. 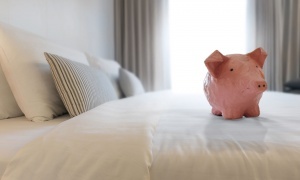 Manufacturers belonging to this scheme have to meet certain standards and sign up to a code of practice (see our adjustable beds funding, consumer rights and contacts page for more information). Interested in other ways to make life easier? Check out our mobility scooter reviews and riser recliner chair reviews. Where can I buy an adjustable bed? 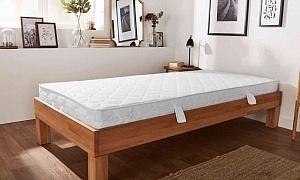 You can buy adjustable beds from some high street furniture stores, such as Dreams and Bensons. You can also buy them from specialist stores, such as Laybrook, Willowbrook and Theraposture. Many companies allow you to shop online as well as in store. Specialist suppliers often have a wider range of adjustable beds with more features. It’s possible to buy adjustable beds second-hand. This can be much cheaper, but we’d recommend checking the bed thoroughly before you part with any cash. If you go down this route, you might want to consider getting a second-hand base and buying a new adjustable bed mattress to go with it. Expert tip: if you already have a long-term, changing health condition, think about ‘future-proofing’ your bed purchase. You might not need a fully adjustable bed now, but may be worth buying one that can be adapted in future to meet changing care needs. Our Later Life Care website also has advice if you're looking at choosing and buying home care products. 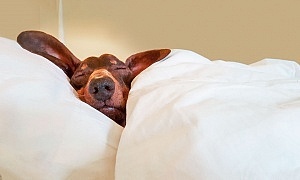 Adjustable beds tend to cost more than standard beds. The bigger the bed, and the more features you opt for, the more expensive it will be. Many electric beds also come in king or superking sizes. You can expect to pay more for these. What features does it have? Make sure it has all the features you want, or might need in the foreseeable future. Can you try before you buy? Does the company offer a free demonstration? Is the bed comfortable and easy to get onto? Safety If it’s electric, does the bed have an anti-entrapment mechanism that will sense an obstruction (such as a carer’s hand or sleeping partner’s leg) and stop the movement of the bed? Are the mattress and base compatible? Profiling beds need special mattresses. Sizes are not standard, so check dimensions if not buying the base and mattress from the same manufacturer. Does it come with a warranty? How long is it for? What does and doesn’t it cover? Will it fit? Check the dimensions of the bed to make sure it will fit in the room and that you can get it through the front door, up the stairs etc. Is there a weight limit? Some beds have maximum weight limits. If the bed is for someone over 20 stone, it is worth checking the limits of the bed you want to buy. Does the store deliver? Is there an additional charge for this? Will it take the bed to the desired room/position for you? What about removal of the old bed? Many companies will take your old bed away when they deliver the new one. Is there any charge for doing this? How should you maintain it? Check what day-to-day maintenance and servicing is recommended and who will do this.